Use my computer for calls (Default Setting): Allows Jabber to work as a Soft Phone and use your computer’s microphone and speaker for phone calls. Use my Phone for calls: Allows Jabber to control your desk phone. When in Desk Phone Mode, when you make or receive calls using your Jabber client, your Cisco IP Phone will automatically go into Speaker Phone mode when the call starts. 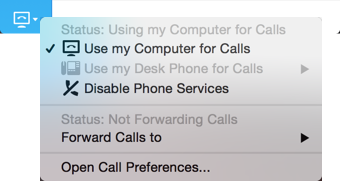 Forward Calls to: Allows Jabber to set your call forward settings. Disable phone services to: turns off phone control and prevents incoming calls via Jabber to set your call forward settings. Switch between computer and desk phone modes or modify other phone service settings.